Motion Sequences are tempo-synchronized, completely customizable control sequences which can be assigned to virtually any synthesizer parameter - and provide incredibly creative new ways of programming sound. Before we recall and look at the example Performance, let’s take a moment to get some new terminology clear. While the concept of a sequence is clear to most of us, what actually is a "Motion Sequence" really? We think of Notes as being the things recorded to a sequence. Similar to how when someone mentions "arpeggiator", it is the Noted arpeggio Type that we think of first. In the Motif series you could, however, select arpeggios that where Controller messages instead of notes. These control Arps would apply control changes to your direct playing. They might rhythmically adjust volume or pan position, some added pitch bends, some made changes to filter cutoff and/or resonance. This is a good background for gaining an understanding of what Motion Sequences are like in MODX. They are not Notes, but are automation for parameter controls - what exactly you patch them to do is a part of the creative use of this feature. How you use this is wide open. The comparison to Arpeggios is very on-point. There are 8 Arps and 8 Motion Sequences. They can be paired and recalled in tandem; they can be assigned, in any order, to one of the eight SCENE buttons. [SHIFT] + [SCENE] will register selected Motion Sequence and Arpeggio to a [SCENE] button. A Motion Sequence is a series of up to 16 steps. It can be as short as 1 step and 16 steps at maximum. Each Step has an “Amplitude” setting and can be extremely complex. A Motion Sequence can be set to Loop, or play when Triggered (like an arp). A Motion Sequence can be adjusted as to timing, intensity, feel (like an arp) via MS FX. You can assign up to eight desired Motion Sequence types for any one LANE. You can also set up to four LANES for one Part. A LANE is a pathway to a specific parameter or multiple parameter destinations. Up to eight LANES can be used at the same time for the entire Performance - simultaneously. You can construct these Sequences manually or select from a variety of preset Sequences. They can be real time adjusted, shaped, and interacted with as they happen. The shapes and nature of these Sequence steps is wildly and amazingly deeply programmable. Sequences can be set to loop, or they can be triggered manually as "one shot" phrases, or retriggered at "each key-on", or just play from the very first key-on, etc., etc., etc. They can be sync'd to tempo, they can be set to divide or multiply the current tempo (stretching out to some 64 measures; they can follow the arpeggiator and start when it does, they can run freely. Tempo and timing offsets can be applied (like PLAY FX in the XF) allowing you great flexibility in how they "feel" when applied to the synth. You can sharpen and/or amplify their influence on the target. You can use these in rhythmic ways - the obvious and typical use would be a very rhythmic movement of the cutoff frequency, or the rhythmic pulsing when assigned to volume or pan position. The assignments go way beyond these typical uses - they can manipulate a wide palette of parameters, even parameters that control other parameters. And since they can reference tempo, or even be manually triggered, you can use this feature to accomplish all kinds of musically related automation. Ability for MODX to link with and derive tempo from external devices means that it can play "tempo/measure aware" of its surroundings. More on this in future articles. You can use it to add a single change event that occurs at set intervals - many times events are set to occur at 4, 8, 12 or more measure - using the “Unit Multiply” setting you can change how your Sequence references the Tempo. “Unit Multiply” = 100% would make sixteen steps equivalent to 1 measure. You can expand the reference out to 6400%. The PART SWITCH for each of the 16 Synth Parts defaults to ON. You must additionally activate a LANE for anything to happen. The MS MASTER (Motion Sequence Master) Switch is repeated in this screen and this operates the front panel button's [MS On/Off] function. (The Master ARP ON/OFF and MS ON/OFF are adjacent to each other on left front panel). In the screenshot above, you can see the four Lanes available per PART. Total - there are 64 LANE switches. - the "ACTIVE" box counts how many of the eight simultaneous LANE switches are currently active. Only PART 1 has a Lane Switch active in the above shot, so 1 of 8 is shown as Active, "1/8". Actually, there can be 8+1 Lanes active. The "+1" refers to the dedicated Motion Sequence available for automating the Super Knob movement (covered separately). Shown (above) "Edit - PART 1 - COMMON > "Motion Seq" > "Lane" screen. Here you will find the Master Switch for the Motion Sequencer (repeated) and the PART Switch, as well (repeated) for convenience. Notice the Shortcut Boxes to 'LOAD SEQUENCE' and to 'EDIT SEQUENCE'. We start here with two very obvious Destinations - easy to hear and recognize. Increase the Ratio to get a sense of what is being changed. Polarity is set independently for each to bipolar - we are offsetting the cutoff frequency above and below a normal setting; with pan we are moving right and left from a center position. Switch between Destination 1 and 2, and adjust the Ratio amount, observe (hear) the influence. Source: MS Lane 1 > Cutoff. Source: MS Lane 1 > Element Pan. As you can see it is possible to assign more than one parameter to a Lane. You simply touch the "+" ADD icon to add a new Source/Destination setup. 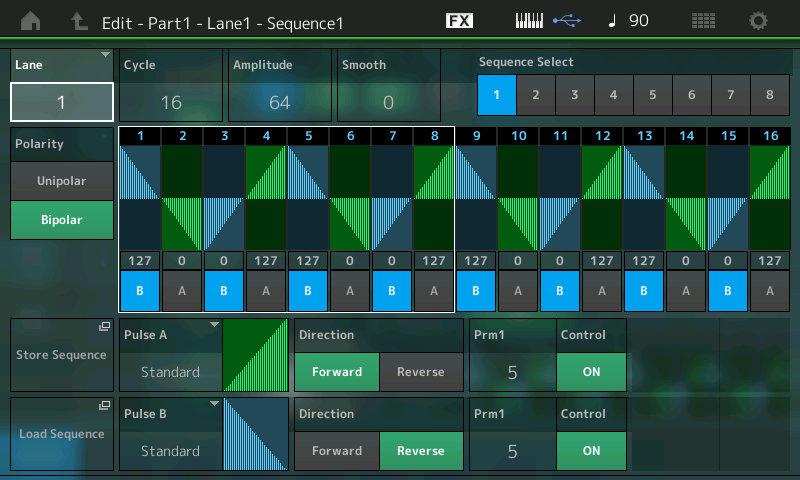 The significance of being able to select as the SOURCE "MS Lane" means that you can group your automation shapes - In a Part with multiple Elements, a Lane could be assigned to influence Elements 1-4 to create coordinated movement in both filter cutoff and pan position, while a second MS Lane could be used to automate contrary movement in Elements 5-8, or move at slightly different rates and directions. It's a synthesizer! As mentioned before, each Part includes eight Motion Sequences, 1 – 8, which can be selected at any time using the “SEQUENCE SELECT” buttons, while here on this EDIT screen; they can also be linked to the red SCENE buttons (more on this later). If, for example, you switch to SEQUENCE SELECT number 2, you will receive a new set of 4 lanes with completely different Motion Seq steps, Curves and other parameters. It's huge. But please remember the limitation of maximum 8 Lanes, simultaneously. Later we'll take a look at a PERFORMANCE that uses all 8 Lanes of assignment. Basically, you will not always need several Lanes for a Motion Seq, because you can assign more than one parameter to a Lane. But it can be extremely interesting to use different Lanes for specific control assignments. Using the UNIT MULTIPLY feature, you can space events out over entire sections of music. If you think of the 16 Steps as one measure, this equates to UNIT MULTIPLY of 100%. You can expand the time out to 6400% (64 measures). Your mileage will vary. The ramifications of assigning more than one parameter to a Lane are that it will follow the same control movement, which, musically speaking, can be just fine. The degree of response is individually programmable. In our example, both Cutoff and Element Pan share the same Lane, but each has its own set of "depth" parameters that determine how deeply it gets applied. When making your own programs you will need to determine which parameters need to be controlled with their own independent movement, and which can share. You can edit the steps of the Lane to an extremely deep degree. Notice that the Steps are divided into two sets of eight on the screen, 1-8 and 9-16. (A white box in the screenshot above outlines STEPS 1-8). You can set the CYCLE value to any number of steps, for odd time signatures, etc. They are grouped in sets of 8 so that you can use the 1-4/5-8 Faders and the 1-4/5-8 Scene Switches to adjust the Amplitude and select the shape Pulse Type A or B in real-time, respectively. This hands-on method will allow you to intuitively set accents or swap Pulse Types to create different movements. Rather than step-editing by accessing one Amplitude value in the screen at a time, you can quickly create Amplitude 'shapes' using the Faders. Then you can dial it in, by accessing the individual values. Try it. Move the Faders to adjust the amplitude of the corresponding Step and touch the blue SCENE buttons to switch it from Pulse A to Pulse B (blue). Beside setting the values of the steps, the most important thing is to set the Curves and determine their Shape (prm1/prm2) – separately for the Normal and Accent steps. You can select one of the 18 PRESET Curve types. Each Curve Bank A/B includes a specific number of curves with different shapes. You can see what they are talking about by adjusting: Prm1/Prm2 – which help shape the segment. When the "SMOOTH" parameter is turned down (lower the value), you will hear more of a radical impact. "Smooth" does just what it says, it rounds off the results - so you can make sharp abrupt changes or rolling smooth changes. The two numbers (PRM1/2) are used for distinguishing the different shapes of a Curve type. The first number stands for coarse, the second number for fine distinctions. In case of the Curve type Resonance there are totally 30 possible Curves Forward and 30 possible Curves Reverse. On the Lane 1 line in the screen you can see the Lane Switch and the MS FX Switch. Then the "Trigger" (currently Off) allows you to manually trigger the MS to play as a one-time event. You do so by using the dedicated [Motion Sequence Trigger] button located near your Wheels. Much like Arpeggio Phrases, there are a variety of ways to use a Motion Sequence. Think beyond just "looping" (Cycle) events. The parameter Direction, (found in the MS Edit area) selects between forward and reverse. If you want to realize separate Steps and Curve settings for specific parameters you can use more than one Lane. In this case you have to make different control set (Source/Destination) routing for each parameter. Touch the shortcut box "Load Sequence". Touch it to open it and select "BIG TRIANGE 4". Below I have set SYNC = TEMPO. And the CYCLE = 16 steps. Press [EXIT] to return to your "Mod/Control" > "Control Assign" screen and experiment with the parameters. You can clearly see/hear the Filter follow this movement and the Pan also follows this same movement. Visually you can picture the filter closing and opening following this Big Triangle as it makes four trips per Cycle. If you assign it to Pan, then you will hear it manifest itself by moving the signal from hard right toward center and then to hard left. Play with + (positive) and - (negative) RATIO values to hear the change in application. Just because a Part can utilize four Lanes does not mean you will apply that many to a Part. A single Lane could be simultaneously changing multiple parameters. In the example we see it change filter cutoff and panning. Panning the Element might be enough. Certainly panning, and volume, and cutoff and LFO speed might be overkill for a single Part, but you could use all four pathways to assign control on this one Part. That would leave you just four other pathways (Lanes) you could establish elsewhere for this Performance! A quick study of how the programmer's of MODX use Motion Sequences (MS) will give you a better idea of how to apply this tool. We'll give you a list of Performances to look at in the Extra Credit area at the end of this article. The Super Knob has its own dedicated Motion Sequence which can be used to automate the parameters assigned to it. This is in addition to the 8 Motion Sequences available to the individual synth Parts. The Sync and Tempo settings are complex. "Speed" setting used only when SYNC = Off. The Super Knob Motion Sequence works basically same way as the Part Motion Sequence. But assignments in the Controller Box are not needed, because it is simply an automation of the Super Knob movement. If you want to control the complete range of the Super Knob it is needed to set Polarity to Unipolar and Amplitude to 127. Touch the "EDIT SEQUENCE" box and work with the POLARITY. Study PERFORMANCE: "Wax and Wane"
"Pad Pulsations" - This Performance utilizes the maximum 8 Lanes of Motion Sequence. And has 8 different Motion Sequences. Explore. "Motion Filters AF" - Try different Filter automation via the SCENE buttons. "Pond Ripples" - This Performance uses the Super Knob Auto Play. "Bit Performer" - This is an example of the Motion Sequence placed on the button [Motion Seq Trigger]. Catch up on the previous article in the series - "Mastering MODX: Envelope Follower".